How to have a Word and PDF Document show off-white, ivory or light gray background on screen but automatically print on paper as white? Motivation behind it: On screen its better and easier to read with lesser contrast with an ivory, off-white, light gray background, but have a normal print of the same on plain paper - whatever it may be. I'd like to have this happen after the document is sent out to others and they may not play with the options but mostly see on screen and print sometimes. I am trying to play with this and see.. If there was some way to trick/ hack the document to make it happen. It is quite possible that there is no real way to do this and I might have to just go with a very small variation from white to be suitable for both - screen and print. I am just curious if an anyone has any thoughts, suggestions, ideas, experiences or hacks? PS: I know that this can be done easily with HTML and CSS documents. I am wondering if there was some way or "work around" for DOC/ PDFs to do this. I saw this thread also and I figure there is some other way out as the documents will be sent out and I'd like for the Screen vs Printing to be seaml - ?? As you can see, in my example I have chosen to use orange for demonstration purposes only. By default, this will print normally - i.e. with no background colour; you can double-check that this is the case by viewing your MS Word Options (Office Button (MS Word 2007) or File tab (MS Word 2010)) and selecting Word Options then navigating to Display and ensuring that there is no check mark against Print background colors and images. However, if you wish to print images, then my advice would be to complete the document first, then uncheck this option, print your document, and then reapply the check mark / tick to this option to restore the functionality that you desire. Furthermore, as few people rarely modify this particular option, then the default behaviour of MS Word will achieve the desired behaviour of this document without the user having to do anything more to it. However, as above, you should mention this option (or even refer to this answer) if anybody wishes to print the document. It can be done in Acrobat. In "Tools," then under "Pages," select "Background," then "Add Background." For "Source," you can select "From Color." There are other options to apply the color to all pages of the document. Be careful with graphics in the document. Some composition system add a white box under images (which is good for image display). We have a page stamping application that adds a white box under the bar code. This is not a big deal in black on white pages, but the white box will appear if the page has a color. Not the answer you're looking for? Browse other questions tagged display microsoft-word pdf printing adobe-acrobat or ask your own question. Can you make MS Word display a black background with white text, but print the inverse? 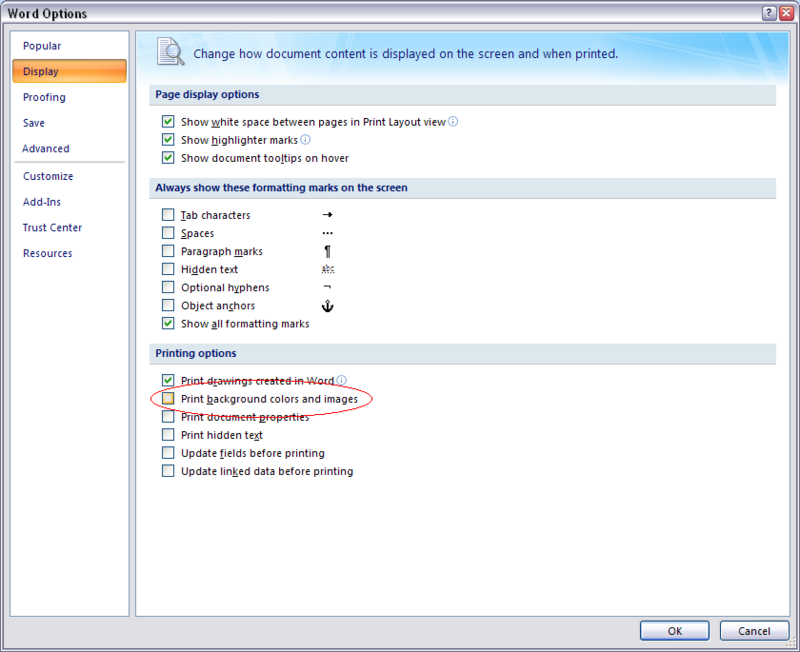 How to make Microsoft Word ignore paper tray settings?